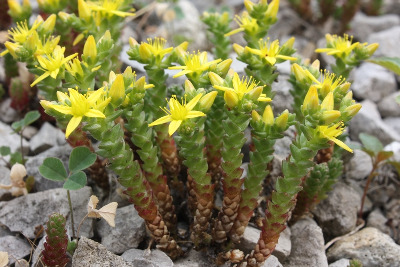 This Old World species is widely naturalized in northern North America and is the only Sedum commonly found in Michigan, where it may occur in relatively natural settngs such as rocky shores or outcrops, sandy shores (perhaps where fragments have been washed up) and dunes. Also frequent in more disturbed settings such as along roadsides, near cemeteries, in lawns and fields, etc. First collected in the state in 1883 in Keweenaw Co. Forms dense moss-like mats which, because of the low stature, withstand mowing. When in bloom, the bright yellow flowers are often conspicuous along roadsides. MICHIGAN FLORA ONLINE. A. A. Reznicek, E. G. Voss, & B. S. Walters. February 2011. University of Michigan. Web. April 21, 2019. https://michiganflora.net/species.aspx?id=871.